Submissions to "PKA PRESENTS LIFE IS GOOD"
Every morning we move a few horses into different pastures. I took this photograph before we moved these three pasture mates. The black horse and the chestnut horse are both Paso Fino stallions that are cousins. They share the same grandparents. The third horse is an older Standardbred gelding. Paso Fino horses in general are very gentle and friendly and enjoy a lot of attention. The breed makes for great trail horses, competitive horses in the show ring and in competive trail and in endurance racing. -Classic Fino - Forward speed is very slow, footfall is rapid while steps are short. Ultimate collection. -Paso Corto - Moderate forward speed, medium extension and collection. -Paso Largo - Fastest speed, executed with a longer extension and stride and A well conditioned Paso Fino can travel at the corto for hours, and thanks to the smooth gait, so can the rider travel for hours comfortably. The gaits of the Paso Fino are genetic, so it requires no training! The natural movement acts as a shock absorber, and the rider feels no bounce while riding slowly (walk), moderately fast trot (corto), or at a flying speed (gallop). The rhythmical quality of the four-beat gait delivers a sound, like that of a percussion instrument, is quit phenomenal. This digital painting is based on photographs I have taken of the Paso Fino stallion, MiAmigoFino Contratercero, a fine friend and a fine example of the Paso Fino breed. My favorite artworks are those that include horses. The Paso Fino name means 'fine step'. The Paso Fino is a blend of the Barb, Spanish Jennet, and Andalusian horse and was bred by Spanish land owners in Puerto Rico and Colombia to be used in the plantations because of their endurance and comfortable ride. All Pasos share their heritage with the Peruvian Paso, the American Mustangs, and other descendants of Colonial Spanish Horses. Puerto Rican and Colombian horses, as well as Paso Finos from Cuba and other tropical countries, have been interbred frequently in the United States to produce the modern American Paso Fino show horse. On the second voyage of Christopher Columbus from Spain to the Americas in 1493, he disembarked with his soldiers, 20 horses and 5 mares on the island of Borinquen at the bay of Aguada (today Anasco), and gave the region the name San Juan Bautista. Soon after, in May 1509, the first governor of the island, Juan Ponce de Leon, brought horses to Puerto Rico from his hacienda, El Higuey, located on the neighboring island of La Espaoola (now Hispaniola). Full Speed Ahead is based on two Paso Fino mares. The mother, dam, on the left, is Preciosa and her daughter, on the right, is Ay Coco Caramba. It is often hard to believe that horses with such enthusiasm and zest for running allow us humans to sit on their backs! Wow! Paso Finos are the horse with the fine step! Their Spanish heritage can be seen through the proud attitude, style, and elegance of their movements. Paso Fino horses are known for being gentle and loving on the ground, but full of energy, drive, and stamina when ridden. The Paso Fino performs a gait unique to the breed that is quick, smooth, and totally natural! It is a four beat gait like what other non-gaited breeds do at a walk. Paso Finos can perform this gait at speed. The Paso Fino is an extremely willing horse that truly seems to enjoy human companionship and strives to please. It is spirited and responsive under tack. Can you feel the intensity of these Paso Fino mares? Can you feel their energies? What has triggered and released such passion? Sunny day, horses love to be in motion and feel they are alive. and break through the summers quiet. In winter, energy needs to be conserved. In winter, horses need to eat. and run with the wind and to enjoy being horses. Sold a canvas print of this digital artwork to a buyer in NEW YORK. Thank you for purchasing this artwork and for your encouragement and support by purchasing it. Horses are very deep and sensitive creatures. Each has his own personality. Some are more open while others are more skeptical. When you look into this Paso Fino stallion's eyes what do you see? I love poetry. Here is my latest! to see the inner me. Making it difficult to see my inner self easily. And then and only then, will I let you read my eyes. Contratercero a/k/a Bud loves me to keep him company as he eats. As I was sitting with him yesterday, I realized that I am living my dream. I listen as he chews and it becomes music to my ears. I squint and just barely can see him and what I see and hear becomes like a dream. I breathe deeply and let this scene take me away to a very relaxed and tranquil state. Nothing else matters or intrudes on this moment. I created this latest artwork from that moment, that feeling! Winter Moments- With My Friend, Bud! Contratercero a/k/a Bud, our first Paso Fino, changed everything for me. When we became involved with him, I did not realize where it would all lead. It led to a deep appreciation of the breed, and Contratercero took over my life. There is no more wonderful breed of horse than the Paso Fino, and Contratercero has taught me so much about handling and riding these fine horses. I have learned that respect is the key. I need to show respect and gain the horses respect and the rest follows. A horse may cut some slack for a person he likes, but he needs to respect the person first. Once my horses and I have a mutual respect, there is no stopping us. We love to spend time together riding and hanging out. There is nothing more wonderful for me then spending time with our horses, especially Contratercero. Contratercero and I have been involved with the Pasos For Pleasure program since 1997 and achieved first place in the PFHA Pasos For Pleasure for the 2007-2008 year, participated and won in endurance, long distance pleasure, and won twice National PFHA High Point Long Distance Pleasure Trail Horse and National PFHA High Point Endurance Trail Horse. We won the Gaited Horse Association gaited horse race, received high point for several years with the Gaited Horse Association as horse and rider of the year, and the list goes on. There is so much I have been doing with Contratercero and loving every minute. The best times are those quiet moments Contratercero and I spend in his pasture enjoying our time together. We were very lucky that the first Paso Fino we purchased turned out to be such a fine stallion. All of his offspring are beautiful, well gaited, intelligent, loyal, and love to do. We have info on us and our horses on our website: http://PasoFinoHorseFarm.weebly.com. 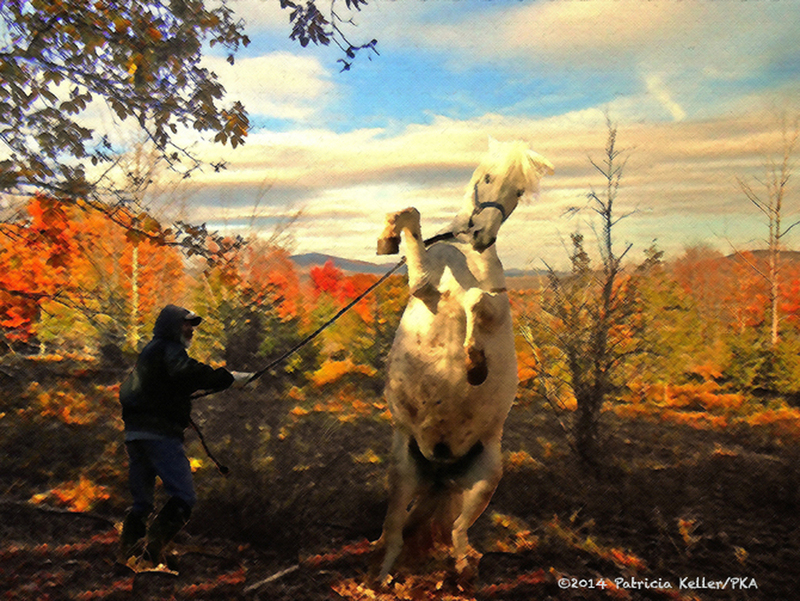 We welcome visitors to come meet our horses (our horses love visitors especially when they bring carrots) and maybe even ride with me, my husband, and our Paso Finos on our Catskill Mountain trails and enjoy the best riding ever! Call 518-299-3103. Paso Fino horses love to be with their people. They are kind of like how dogs are with their people. This is a photograph of my husband, Roland and our Standardbred horse that we call The Mighty Columbo. Columbo came into our lives in 1994 after our Standardbred, Owego Chico a/k/a Sebastian, our horse of 20 years passed away. Sebastian left behind his 20 year companion, Amadeus, who was mourning the loss of his close friend. Amadeus changed the day Sebastian died. We heard about Columbo and knew he was the horse for us. He was misunderstood in the place he resided and was not taken care of properly. His hooves were a mess and it took years for them to come right. I started retraining Columbo. He had lost all his self confidence and couldnt do anything at the time he came home to us. The one thing he did do was save Amadeus life by becoming his companion. And Columbo relearned to drive. I drove him all over in a cart and then decided to start training him as a riding horse. After a couple of years, my husband started riding him and he and Columbo became great friends and riding partners. Columbo and Roland won an endurance race in 2001. Columbo has been with us, on August 20th, for 19 years. He is our winner and our friend. Horses love to horse around and to play. I am always so impressed with the beauty of their moves. Usually so graceful and powerful and filled with a certain zest for life and yet at the same time they can be so gentle, sensitive and caring. 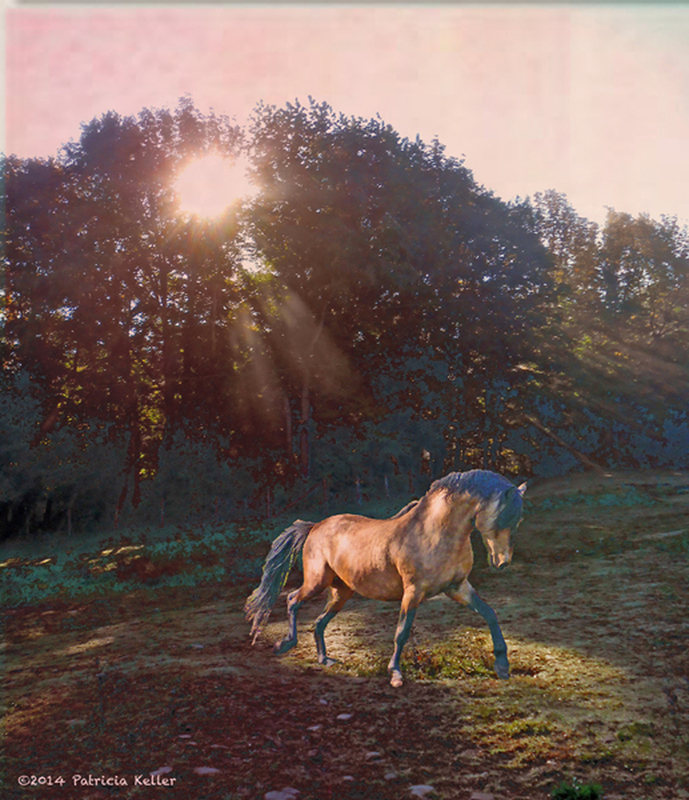 Here is my latest poem entitled, "Stallion"
The artwork is based on a Paso Fino stallion. Have you ever met a Paso Fino horse? Have you ever had the pleasure of riding a Paso Fino horse? They are just not like other horses. They are what is called a gaited horse breed. They travel in a foot fall pattern which is like a horse walking. It is a 4-beat foot fall that can be performed at many different speeds from very slow to very quick to very fast. When riding a Paso Fino, I feel such an amazing energy, excitement, thrill, and joy with the ride. 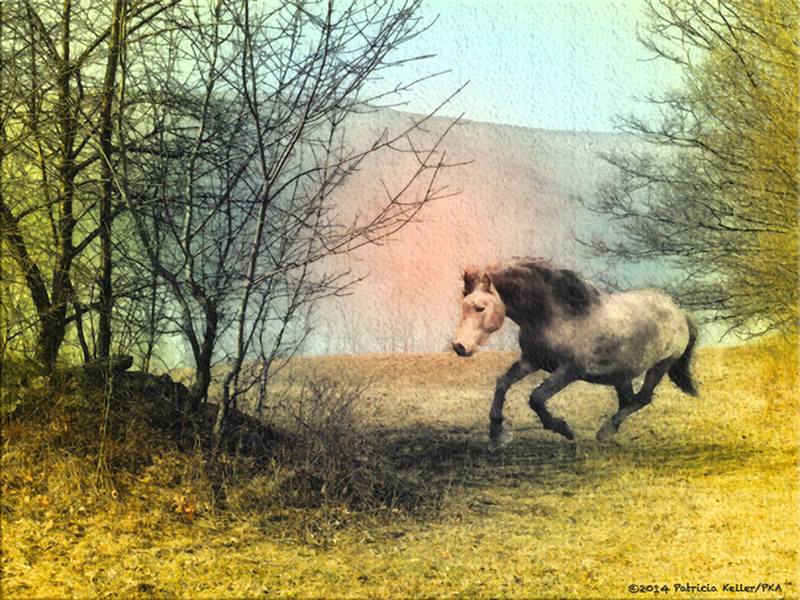 Paso Fino horses have inspired many of my artworks and photographs. I hope you will enjoy this work which is based on the Paso Fino stallion, Senor Brio Contratercero. with every step he takes. that emanates from this body. with every breath he takes. Ay, caramba! from the Spanish interjections ay (denoting surprise or pain) and caramba (a minced oath, a euphemism for carajo), is an exclamation used in Spanish to denote surprise (usually positive). The term caramba is also used in Portuguese. The fictional character Bart Simpson from the American animated sitcom The Simpsons used the phrase Ay Caramba when surprised. It became one of his most notable catchphrases, further popularizing the phrase in modern pop culture. For example, in the episode Selma's Choice, Bart, Lisa, and their Aunt Selma approach a very popular ride at Duff Gardens. Upon seeing the exceptionally long line for the ride, Bart exclaims, Ay, Caramba! Also, Desi Arnaz in the TV show I Love Lucy often used this expression. Paso Fino horses, if allowed, can demonstrate all kinds of emotions and movements. Even though they are so enthusiastic, they can still be very much in-hand especially if they are with someone they feel very comfortable with and that person understands, the horse will be careful to stay with his person and not to aim his enthusiasm at that person. 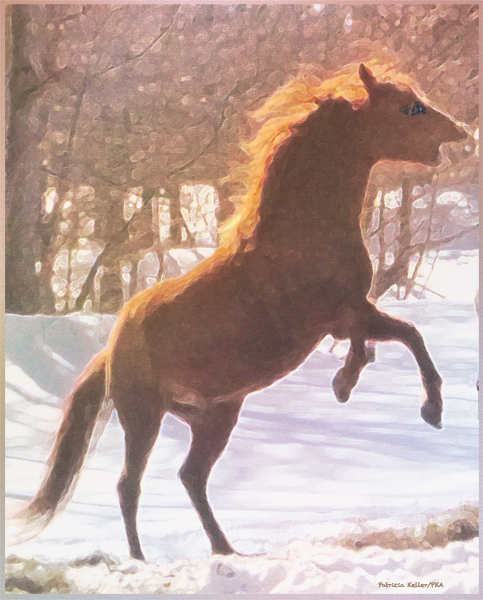 This artwork is based on Ay Caramba Contratercero, a Paso Fino stallion that resides on The Paso Fino Horse Farm, Prattsville, NY. In this work, Ay Caramba, Caramba is being taken out of pasture and just so glad to be with his person! I love reading poetry and sometimes I even will write one. Hope you will enjoy my latest that is written especially for this artwork, "Ay, Caramba!" . He calls, I am free. I have known since the day he was born. Horses are such beautiful creatures. I feel so lucky to be able to see and to watch horses as they move. Their movements are so graceful. This work is based on the Paso Fino stallion, Senor Brio Contratercero. He loves to move and to show off how gorgeous he is. I hope I have captured this beauty in this new work, "In The Light". 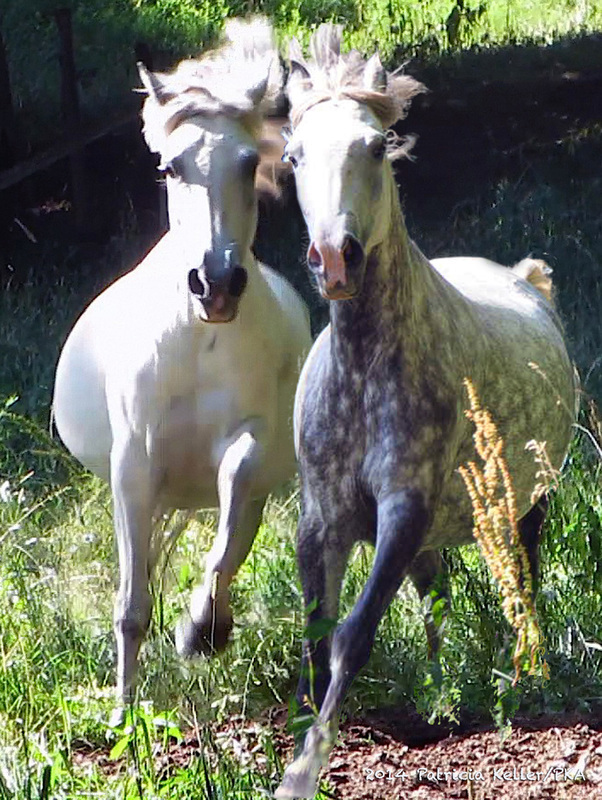 Paso Fino horses are very active and love to play with each other as well as with their people. The Paso Fino breed is well known for the quality of loyalty and devotion to their people. Similar to how a dog will choose his person. I love to ride my Paso Fino horses as well as to just hang out with them or watch them in pasture. Paso Finos are a gaited breed. They travel at speed in gait, a running walk. They, also, canter and gallop as well as do a broken trot, called troche, and a broken pace. The Paso Fino is praised as the smoothest riding horse. Writing poetry is one of the creative ways to express myself. Here is my latest work. what is in the light. the light of this perfect day. View as a slide show or click at either side of the images to move forward or back. Click on any image to see the image larger and for more info about the work. Creating art especially for clothing. This artwork, entitled "Springtime Frolicking"